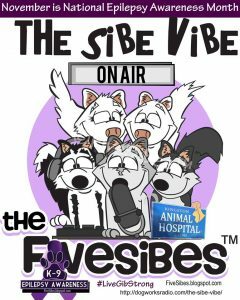 The Sibe Vibe is hosted by the Five Sibes Mom, Dorothy Wills Raftery. On this episode she talks to Dr. Arnold Rugg, Medical Director & Owner of Kingston Animal Hospital, Kingston, NY Website: http://kingstonanimalhospital.com/ On this episode we are talking about canine epilepsy. thank you for this Dorothy. I am in India where there isnt much information about huskys yet…the canine epilepsy group has been a life saver for us. My husky zane has idiopathic epilepsy. Unfortunately the best vet in town doesnt have the experience with huskys to be best person to go to for this. She is a good vet though. Given this, my family and I have decided to educate ourselves better inorder to give Zane the best chance. Currently, we have just put him on grain free- Farmina and Goodness. Zinc supplements- Zenpro. and raw diet. I have not put him on meds yet as I am not sure what the triggers are. His first three seizures followed a vomit to throw up a foreing object and were 2 months apart. the 4 and 5th seizures were 25 days apart. The last or 5th seizure came after 40 days and was 3 weeks ago. It was very mild as compared to the previous ones and he didnt vomit. I am aware of the kindling effect. I would like your thoughts on whether its ok for us to stall the pheno tilll we know for sure what the triggers are? His blood work is normal except slight variations in the electrolytes. Hi Rubina. Thank you for listening to the show. I think it’s great that you are trying to reduce possible triggers. That always helps. However, sometimes even with our best efforts, we may not always be able to find the exact one(s), or stop them. It’s important to have a conversation with your vet to see about holding off or starting the Pheno and what she thinks. Also, you may want to talk to her about a vet neurologist recommendation as they specialize in epilepsy. The key is to help manage seizures so the seizures themselves do not cause further damage to your dog. If he has them infrequently and they are not severe, you and your vet may decide it is okay to hold off on the Pheno. If he starts to have them frequently, and it sounds like he is consistently having them 25 to 60 days apart, you may want to consider it. It also depends on the severity. Gibson was placed on medication after he had a grand mal seizure, followed a month later with cluster seizures for which he was rushed to the ER as he was going into his 5th seizure. He, too, was diagnosed with idiopathic epilepsy and placed on the medications Pheno and Potassium Bromide. While Pheno is immediate, Potassium Bromide can take up to a month to get to therapeutic levels in the system, and then it works as a secondary defense. For me, it helped to keep Gibson’s Pheno dosage low. With idiopathic epilepsy, it can be frustrating in that there is no known cause. With Gibson, I also looked into cutting out as many environmental triggers as I could as well as foods – such as rosemary, rosemary extract, wheat gluten, food coloring, preservatives, rawhide bones, and also candles, perfumes, certain essential oils, room & rug deodorizers, yard sprays, insect & rodent repellents, toxic plants & shrubs, paints, etc. Also flashing lights (TV), stress, overheating, and even weather conditions such as storms, lunar phases, and even solar flares can trigger a seizure. With Gibson, I eliminated as many known triggers as I could, and was alert for other ones such as weather. He was placed on the Pheno and Potassium Bromide. Once on medication, there will be some side effects that could last even up to a few weeks until the dog adjusts. Bloodwork would need to be done periodically (after my Gibson adjusted to the meds and was checked, I did bloodwork every 5-6 months. This helps to keep an eye on things, including the liver levels to see if the Pheno is affecting it). I also had Gibson on a natural supplement Milk Thistle to help cleanse the liver from being on Pheno. While his seizures were managed by the meds, he did have hind end weakness from them, for which I had laser therapy treatments done that helped to keep him moving. It’s not an easy decision to make – to medicate or not – what I always say is you want to help reduce or manage the seizures for the health of the dog. Yes, there are some side effects to the medications as well, but you would have to weigh out type/frequency of seizures to hopefully managing them, but possibly having side effects. And, there is always a chance that even on medication, he may still have seizures. This is where a conversation with your vet would help lay out things for you. There are also other medication options you can discuss with her besides Pheno and/or Potassium Bromide. Our goal was to keep an eye on Gibson’s bloodwork and possibly reduce the medication as time went on if he didn’t have any seizure activity. He did have the Potassium Bromide cut in half after being on it for awhile as he became severely ataxic after a formula change with the capsule, unbeknownst to my vet, the public, or me. That was scary! Thankfully, my vet quickly detoxed him and he never did have to go back on the higher dose. An excellent group to join (if you haven’t already) is the Canine Epilepsy Resources Epil-K9 Email list. It’s a wonderful support group where you can post a question through Email and receive information and support back from fellow members who have Epi-dogs, vets, vet techs, a great resource of people with experiences on the list. And they are all very willing to share and support each other. Their website is http://www.canine-epilepsy.com, and you can sign up for the Email list through there if you are interested. It is also a great informational resource site. I hope this helps! And I wish you all the best with your journey. Please feel free to keep in touch and let me know how he’s doing. If you have more questions, please feel free to contact me. You can find me over on my Facebook page: FiveSibes: Siberian Husky K9 News & Reviews or drop me a note on my blog at http://FiveSibes.blogspot.com.